This week I thought I’d explain a little about fine wire upholstery staples. There are two types most commonly found in the industry 71 Series and 80 Series. Out of the two types mentioned the 71 series is definitely the most popular – 22 gauge fine wire galvanised with a 9mm crown. 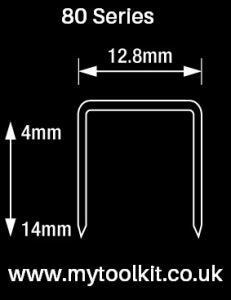 Our box quantities are 20,000 with the exception of 3mm, 14mm & 16mm which are 10,000 per box. We also have a selection of sizes available in Stainless Steel ideal for exterior work, boat building etc. 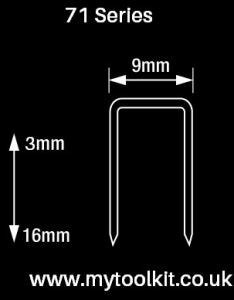 The 80 series type is 21 gauge (slightly thicker wire than the 71 series) galvanised with a 12.8mm crown. The larger crown and slightly thicker gauge helps when fixing very fine materials such as vinyl and breathable membrane. Box quantities are 10,000 for all sizes. Again this type of staple is available in selected sizes in Stainless Steel. Perfect for upholstery outdoors, like boat furniture or when fixing of breathable membrane.